Clare Anderson trained at The Arts Educational London Schools. 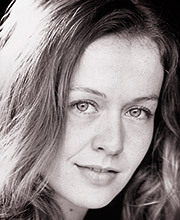 Theatre work includes Rosalind in As You Like It and Katherine in The Taming of the Shrew at Riverside Studios, and on the Edinburgh fringe. She also played the lead in a revival of Clare Booth Luce’s The Women at Battersea Arts Centre, London and toured the UK with Commedia dell’Arte players.